I’ve been busy getting ready for Food Day, hence neglecting the poor blog lately. I’ve ended up the West Coast Coordinator of Food Day, focusing primarily on the Bay Area and other parts of California, as well as Washington State. I haven’t had much time for many of my favorite autumn activities like mushroom hunting, but I did take a few hours after services on Rosh Hashanah to head out into the woods with a friend and find some delicious chanterelles. They were so fresh, and I was somewhat disciplined, so I still had some left and in good condition by the day I was preparing for my meal before the Yom Kippur fast. I wanted to eat something that would be filling but very digestible, and definitely delicious. I settled on something coconut-milk-based, for its long-satiating fat and easy digestibility. 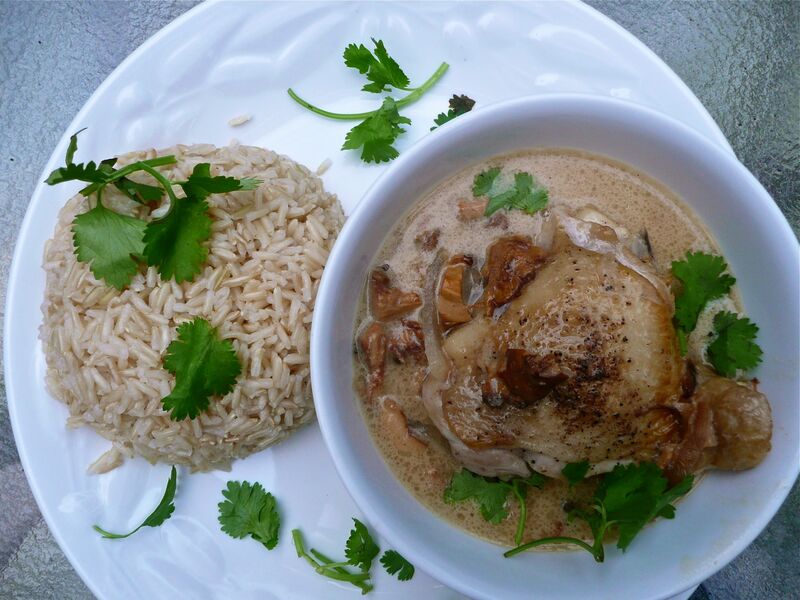 I cooked chicken thighs with a little onion in coconut milk, added a little lemon juice and fish sauce, and served it with brown rice and cilantro. The meal was simple to prepare and even tastier than I expected, particularly because the flavor from the chicken cooked out into and mixed with the coconut milk sauce. Also, when the time came to break the fast on the next night, I wasn’t ravenous. 1. Cook rice separately if you’re making it. 2. In a heavy skillet, like a cast-iron skillet, heat coconut oil. Place chicken parts into hot oil and cook about a minute or two on each side to brown. When you turn them to the second side, add onions all around them and stir. 3. When onions are softening and turning clear and a little brown, add the chanterelles and a little more coconut oil. Let them cook for a minute or so, stirring to make all sides touch the pan. 4. Add most but not all of your half-can of coconut milk to the chicken. Add a dash or so of fish sauce. Cover the pan with a lid and turn the heat to medium. Let it cook for a while, probably in the 20 minute range, until the chicken is cooked all the way through and liquids run clear when you poke the thickest parts with a knife. 5. Taste the sauce and adjust for salt/fish sauce. Grate in some fresh black pepper. Turn off the heat and add lemon juice and remaining coconut milk. 6. Serve with or without brown rice, and with cilantro sprinkled on top.